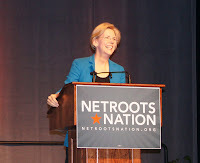 Two amazing women highlighted the second full day at Netroots Nation. Following the standard morning comedy panel emceed by Lizz Winstead, I attended a breakout session "What Progressives Can Do to Stop the War on Public Education. One of the panelists was Diane Ravitch who can best be described as a public education activist. I had the pleasure of speaking with her prior to the start of the session about Marie Corfield's campaign for State Assembly. The other panelists were John Jackson from the Alliance for Excellence in Education, and Kenneth Bernstein, a public school teacher and blogger. Ravitch talked about the great school privatization effort sponsored by ALEC and how schools don't matter to the hedge fund managers that are behind that effort. "Sadly," she lamented, "the Obama administration supports a big part of this agenda" and there are few people in leadership postions that are defending public education. Ravitch called the evaluation of teachers using test scores "junk science." Jackson pointed out that we are re-litigating issues in America that were settled long ago - issues like unions and citizenship. "The public education system works, but as Blacks and Latinos are becoming the majority in urban areas, there's action to kill it." He said we need to increase support for initiatives that work such as early childhood education, and kill programs that don't work like out-of-school suspension. "We are trying to determine if students can swim by throwing them in a pool with no water," he said. Bernstein told the audience that over 20% of students attend rural schools and these districts are generally ignored. Educational outcomes are highly correlated with other needs such as nutrition and even the availability of affordable dental care. The consensus among the panel was that we need to ramp up parent involvement in the future of public schools, and make better use of the Netroots to promote the agenda. It was made clear that the panel is not against all charter schools. They would support non-profit charters that serve underserved constituents on a case-by-case basis. The next session I attended was a panel of three women running for Congress. Darcy Burner is a former software engineer running for the House of Represenatives in Washington State, Congresswoman Mazie Hirono is running for Senate in Hawaii, and Elizabeth Warren is vying to replace Scott Brown in that upper chamber. Burner, who worked for Lotus and Microsoft in the days of the office apps wars pointed out that while Lotus had the better products, Microsoft understood the game better. She used this to analogize the Democrats to Lotus and the GOP to Microsoft. We may have the better policies, but the Republicans know how to game the system. Of course the rock star at this session was Elizabeth Warren. When she came to the podium in a darkened auditorium, people rushed to the front of the stage, cell phones in hand to snap a photo, and the scene where dozens of people were holding phones with lighted screens in outstretched arms looked just like a rock concert. 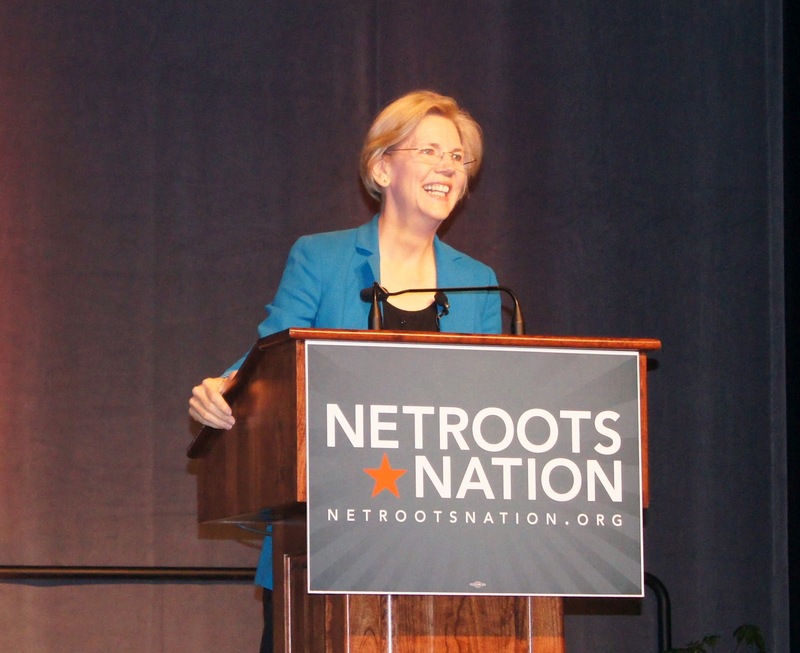 Despite a failing voice, Warren's message was powerful and resonated with the crowd. She told the group how it was important to change the national conversation and bring attention back to the middle class. Some of the progressives that Warren hopes to join in Washington were part of an afternoon panel. Senators Jeff Merkley (D-OR), Sherrod Brown (D-OH), and Sheldon Whitehouse (D-RI) were joined by former Virginia Congressman Tom Periello, elections attorney Trevor Potter, and activist Becky Bond to discuss Citizens United. Of the three senators, only Brown is up for re-election this year, and he is being outspent 6 to 1 by the Koch Brothers and their ilk. In fact, he pointed out that about half of the money that his opponent has raised has come from only 17 people. Merkley pointed out that Citizens United effectively modifies the preamble of the Constitution from “We the People” to “We the Powerful.” Just the threat of big money to the opposition tends to intimidate some elected officials. Potter, who works for the Stephen Colbert PAC, told the group that Citizens United does not even work the way the Supreme Court intended. The court's decision was based on transparency, but the billionaires have found ways to circimvent that. Bond, who runs a progressive Super PAC, will use that group to support candidates who oppose Citizens United and who will help reverse it. My next breakout was a panel discussion on the Supreme Court – decisions that will be announced this term and what's on the docket for next term. The moderator, Nan Aron, President of the Alliance for Justice, said that the behavior of judges have been outside public purview and need to be examined. She specifically mentioned the proactive involvement of Justices Thomas and Scalia in extremist right-wing groups. Dalia Lithwick of Slate pointed out that several sitting justices are in their late 70s, so this election will be important in shaping the court in the decades ahead. This court is one of the most conservative in a generation and each member replaced someone who was less conservative. Fully one third of the federal court system is populated by appointees of George W Bush – mostly young conservatives -and the country will feel their impact for a long time. Debo Adegbile of the NAACP Legal Defense Fund discussed the Arizona “papers please” case which will be decided soon. “There's always a rationale in support of a ruling” he asserted. There's also a higher education diversity case that may chip away at Affirmative Action, and a voting rights case that is pending. Lani Guinier of Harvard said it's time for people to get involved in pressuring SCOTUS to make it's operations and decisions more understandable and transparent. She said the public has a role to play in influencing their decisions. Tomorrow is the last day of sessions, and they'll announce where next year's Netroots Nation will take place. It's gone by fast.